For Suzie, James, and Timmy, it’s the end of the world. And that’s before aliens invade Earth. Watch the sci-fi short film Wasp-Men From Mars!, now on Vimeo. Starring Ashley Rose McKenna, Diogo Hausen, and Chris Markle. Produced by Tora Chung. Written and directed by Gerrit Thompson. Wasp-Men in Retro Black & White! What happens when a Wasp-Man finds itself in modern-day San Francisco? Check out in this fun behind-the-scenes clip from 2016. We’re excited that Wasp-Men From Mars! will be screening at the Thriller! Chiller! 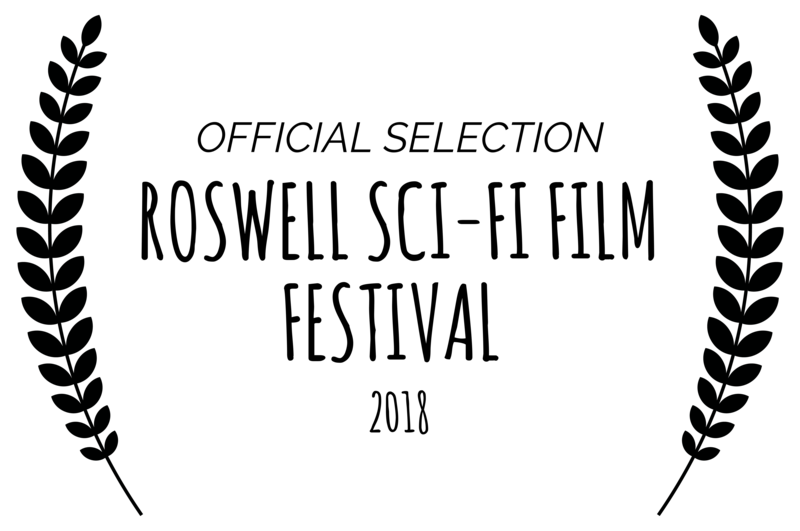 Film Festival in Grand Rapids, MI, later this month. Wasp-Men from Mars! — In 1959, a stargazing trip turns into a night of heartbreak, jealousy, and sexual confusion—and then giant wasps from outer space invade Earth and make things even worse. Three teenagers must put their feelings aside if they’re to survive the night. Panelists include Gerrit Thompson (writer/director), Kevin Jones (director of photography), and Diogo Hausen (actor). Wasp-Men From Mars! will be playing at the Comic-Con International Independent Film Festival during San Diego Comic-Con on Thursday, July 19th. Writer/director Gerrit Thompson, director of photography Kevin Jones, and actor Diogo Hausen will be on hand to introduce the film and do a Q&A afterwards. The screening time will be announced soon. This is pretty appropriate, if we don’t say so ourselves: Wasp-Men From Mars! will screen at the Roswell Sci-Fi Film Festival on Saturday, July 7th at 11:10 AM at the Galaxy 8 Allen Theaters in Roswell, NM. 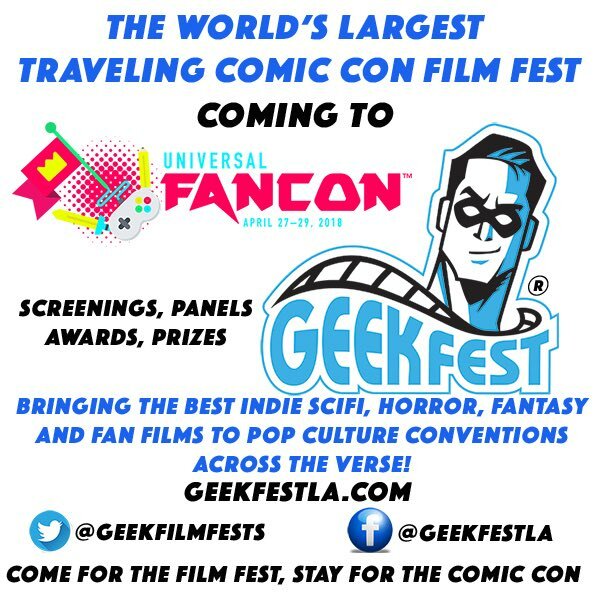 Wasp-Men will be screening at Comic Con Palm Springs on August 26th at 1 PM as part of Geekfest Film Festival. Wasp-Men From Mars! is still making its way through film festivals, but we’re already on to our next short film: Visitations. Visitations is a story about pursuing one’s passions no matter how scary things can get. A talented young illustrator becomes obsessed with books on the supernatural. The stories inspire her art but they also fill her nights with dread as she hears noises inside her walls and feels something unnatural lurking outside her window. As her life is invaded by the unknown, she must decide whether her art is worth the nightmares as she approaches a breaking point. The film shoots this summer and we’re expecting to complete it by October. The crew is made up of members from the Scary Cow filmmaking cooperative. 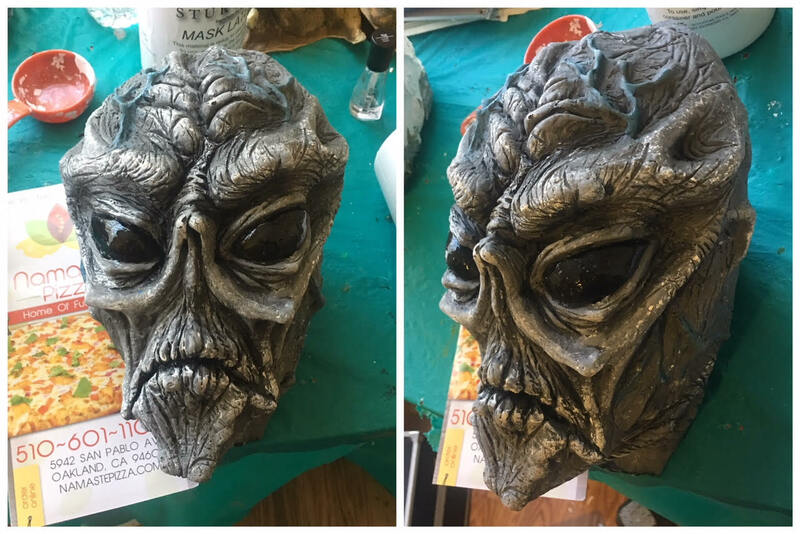 While we don’t want to overhype this, but the film has a really cool alien in it designed by Dave Haaz-Baroque of Shadow Circus Creature Theatre. 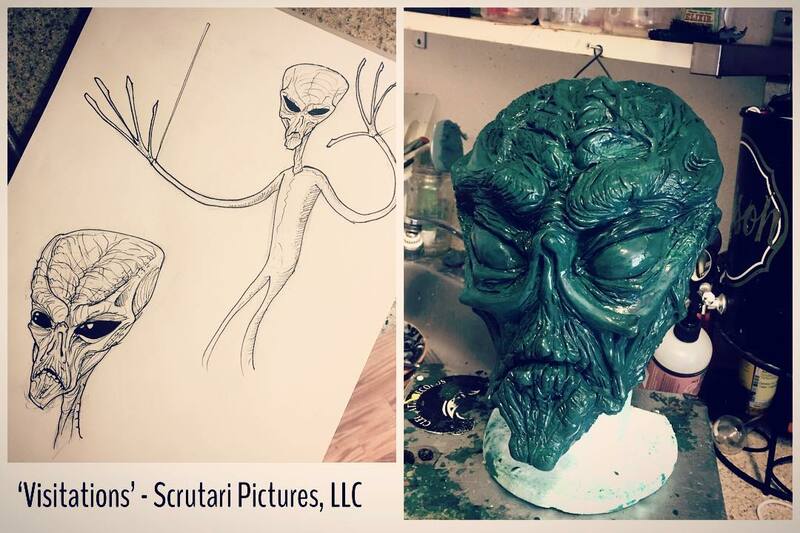 Clips of the alien puppet in progress can be seen on the @creaturetheatre Instagram page. We’re currently raising money to help with the production through GoFundMe. If you were a fan of Wasp-Men, please consider supporting our next movie. Update: The convention has been “indefintely postponed” (cancelled). Read more about what’s been going on with it here. Wasp-Men From Mars! will screen at Universal FanCon in Baltimore on Sunday, April 29th at 1 PM. 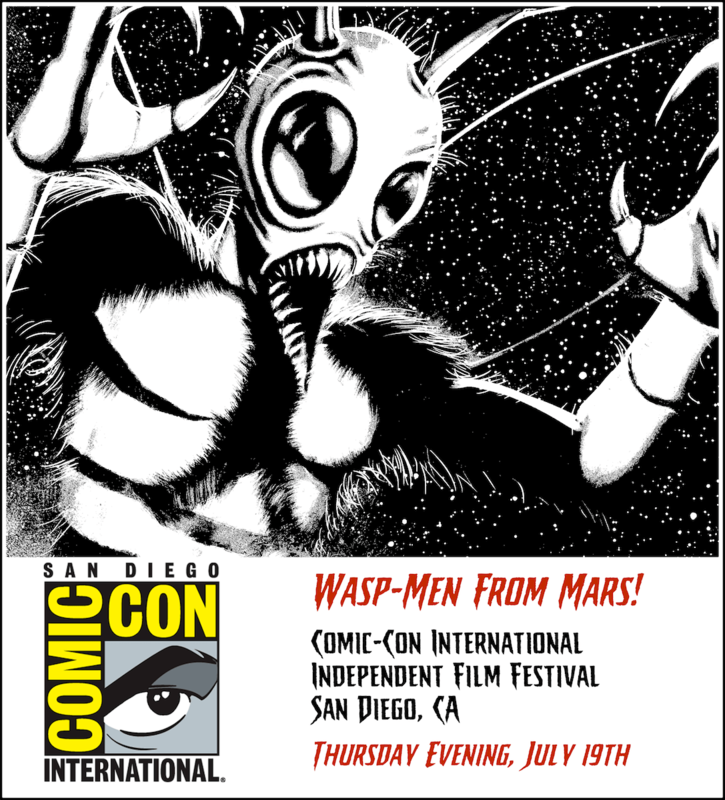 We’re excited to announce that Wasp-Men From Mars! will be playing at the I Hella Love Shorts Film Festival in Oakland, CA, on March 11th at 6 PM at the Flight Deck (1540 Broadway St, Oakland, 94612).